Groundbreaking a New Restoration Site for Riverton Creek. It was exciting for Squad to be the first stewardship crew working on a new restoration site. The City's recently inaugurated Green Tukwila Partnership is cultivating community volunteer Forest Stewards to take the lead on restoration sites of various sizes around town, and yours truly is proud to be the program's first Forest Steward. Nestled in an old neighborhood, this tributary of Riverton Creek provides rich opportunities for restoration that can benefit the community and also salmon downstream. Squad has had the good fortune to work with Sound Stewards at Codiga Park and North Wind's Weir. It is wonderful to see the community stewardship model expanding, such as modeled by the great group of neighbors who steward the Duwamish Hill Preserve, where we also enjoy working. The charming creek curving through the half-parcel is thickly laden with noxious weeds, including blackberry, ivy, laurel, holly and an ominous patch of Japanese knotweed / Polygonum cuspidatum (more detailed information booklet here). Despite our preferences for organic methods, this species requires targeted herbicide injection performed by trained operators. I am working on a masterplan for the site that will outline circulation options, restoration strategies and possible nature-play opportunities for children; as well as working with the City to identify resources. We look forward to watching this site develop from the very beginning! 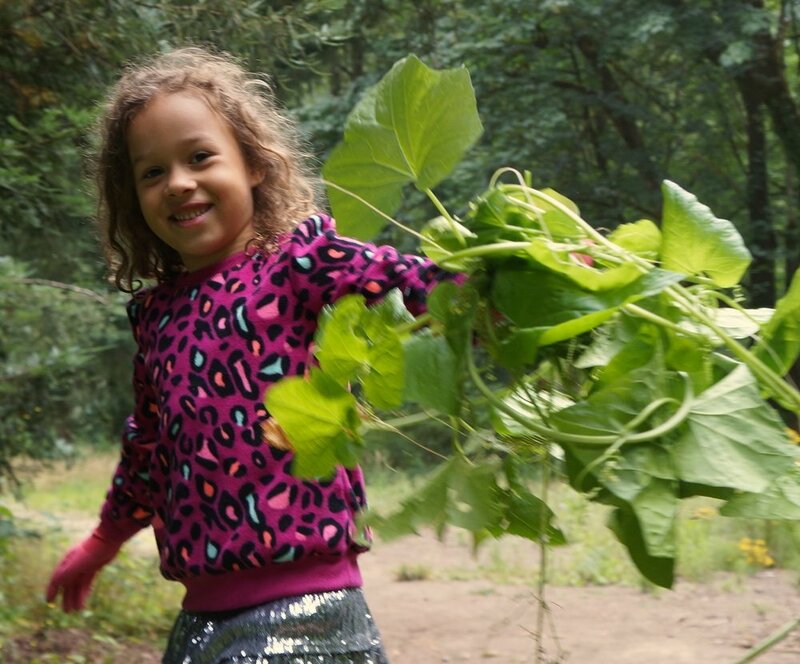 Duwamish Hill Preserve Planting & Play. The Duwamish Hill Preserve was a special stewardship event in numerous ways. Significantly, the site has considerable Native American importance, "the Hill is associated with the southern Puget Sound Salish oral tradition as the key location in the stories collectively known as the “Epic of the Winds.” There is lovely interpretation and art throughout the site including a gathering space showcasing seasonal tribal activities. We all stood upon our birthday-month and learned about what would be happening at that time in a Duwamish village. The hill itself is a glacial remnant that is older than Mt. Rainier! It is geological significant and a real treasure to behold. Kids even found marine fossils with clearly visible shells, offering a memorable indication that this site used to be under water. The top of the hill has wonderful views of the Duwamish River valley, showcasing many sites from the lite rail line to Mt. Rainier itself, framed in bright red madrona berries. In between planting native plants in the new meadow habitat beds the children delighted in playing all over the hill, from scrambling rocks up to the peaks, to bolting down the long stairways. You can read about the superb volunteer efforts to save the hill in a Seattle Times article, "In 2000, the hill was going to be blasted apart by dynamite and developed into an industrial area, much like the properties surrounding it. But the community and Cascade Land Conservancy raised about $1 million through donations, contributions and grants for the city of Tukwila to purchase the land." We we even graced with the presence of an eagle pair flying, calling and perching on a tall electrical tower. We certainly look forward to returning and being a part of the ongoing efforts to develop and protect the Hill.